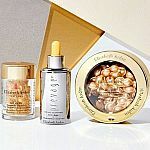 Nordstrom has Estee Lauder Nutritious Night Detox & Glow Collection for $78. Plus 3 deluxe Estee Lauder gift. Plus pick 5 samples at checkout. Shipping is free.